On February 11th, 2013 my boyfriend, his sister, her husband, with their baby, and I went to Disney California Adventure (DCA) and Disneyland, I had work so we didn’t reach Disneyland till 3:30pm. I dragged them over to DCA because I knew they had the Lunar New Year celebration going on and that’s my culture! 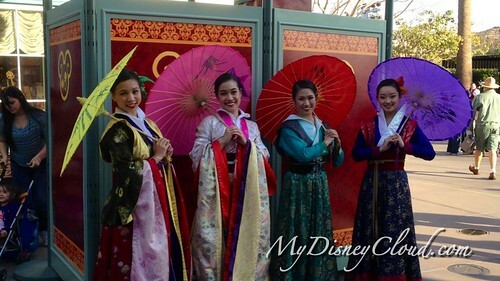 So we were able to catch a bit of the Disney “Limited Time Magic” experience for the Lunar New Year celebration. Lunar New Year 2013 at DCA next to the Little Mermaid ride. 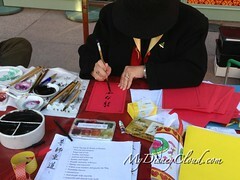 In the Lunar New Year section there were vendors selling specialty Asian foods, and free Chinese calligraphy. I shared my love for these Chinese pork buns and almond cookies with them, they were a lot more open-minded to try it and experience them, which just made me very happy. 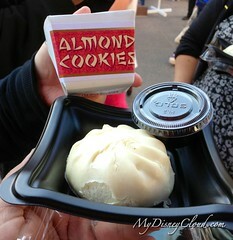 Pork Bao (steamed bun with pork meat inside) with some homemade almond cookies. These are steamed buns with an inside of pork meat sometimes BBQ pork, wrapped in a layer of a white soft bread, there is a bit of a thin layer of glossiness to it. This just takes me back to my Grandma peeling off the outside layer before eating the bun, because back in Indonesia, the steamed buns were sold in vendor carts and they weren’t always the most sanitary of places to make food, so peeling off the outside layer ensured that all the germs and the handling of food on the outside part was thrown away. Thanks for celebrating Lunar New Year 2013 with me!! This entry was posted in Cultural Arts, Disney California Adventure and tagged 2013, asian, celebration, chinese new year, festivities, limited time magic, lunar, new, year, year of snake, year of the snake by JNYFAV. Bookmark the permalink. This looks like an awesome celebration. I’m glad you got to celebrate this at DCA. 🙂 BTW, is the streetcar open? Yes the streetcar is open! 🙂 We’ve been on it once, wonderful experience, and every now and then there is a show performed with Mickey on the streetcar.